This is one of my go to meals when the weather turns a little cold and throughout the winter months. When I need something to make that’s easy, healthy and comforting. Food for the soul I like to say. I serve this with crusty bread, and a green salad. It’s very filling and makes a beautiful presentation for 2 or 6. Hope you enjoy, it’s really very easy , just chop up a few vegetables (carrots, onions, and celery, a basic *mirepoix) open a few cans and buy the chicken, don’t be intimidated by ingredients! This recipe inspired from Giada de Laurentis’s chicken stew. I have made a few changes to suit my taste. *Basic Mirepoix is a combination of chopped carrots, celery and onions used to add flavor and aroma to stocks, sauces, soups and other foods. Usually comprised of 50% onions, 25% carrots, and 25% celery. 16 oz. chicken broth (1/2 box) but you may need a bit more so hold on to rest of the box. I use 4 chicken breasts with ribs ( I usually go to butcher order 2 chicken breasts with bone in, split in two) if you go to supermarket, either buy 2 large breasts, or 4 smaller ones. Skin on and Bones in! app. 1 1/2 – 2 lbs. total weight. You will be removing the skin, it will add to the flavor of the stew. 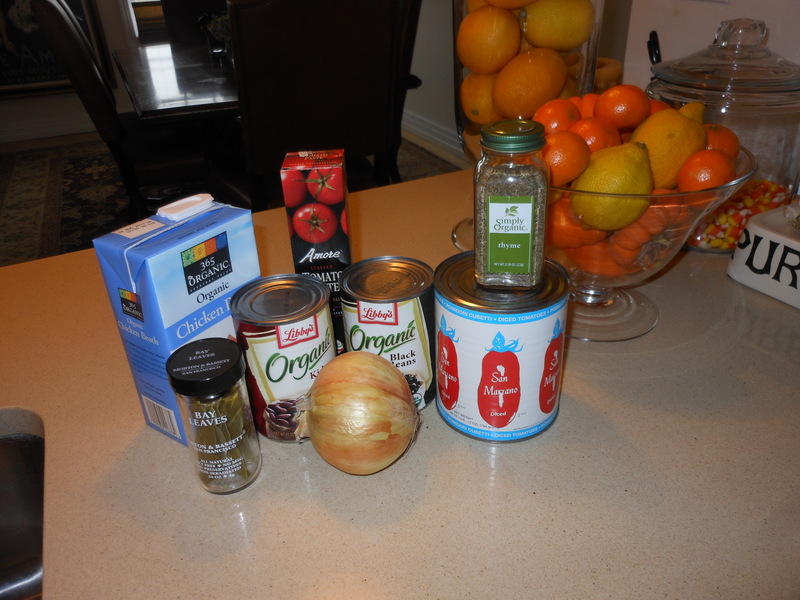 1 can red kidney beans drained ( if using organic, do not need to rinse) 15 oz. 1 can black beans drained ( if using organic , do not need to rinse either) 15 oz. Heat the 2 tablespoons olive oil in a heavy 5 1/2 quart. pot. ( Le Creuset again) heat over medium heat. When oil is hot add the onions, celery , and carrot (Mirepoix mixture). Saute the vegetables until the onion is translucent, about 5 minutes. Season with salt and pepper, to taste. You will taste again towards the end, so if you want to hold off on this step you can. Stir in the tomatoes with their juices, chicken broth, tomato paste, bay leaf and thyme. Then add the chicken breasts , press to submerge in the sauce. Bring the liquid to a slow simmer. Reduce the heat to medium low and simmer gently uncovered until the chicken is almost cooked through, turning the chicken breasts over and stirring mixture occasionally, app. 30 minutes. Using tongs if you have them, if you don’t , buy them, remove the chicken to a plate and allow to cool ( about 15 minutes) Discard the bay leaf, add the beans to the pot ( remember to drain) and bring to a simmer until the liquid is reduced to a stew-like consistency, probably another 15 minutes or so. Discard the chicken skin and bones from the chicken breasts. Shred or cut the chicken into bite size pieces. Return the chicken meat to the stew. Bring the stew back to a slow simmer. Season again with salt and pepper to taste. I usually cook , then turn off heat, and bring it back to simmer right before serving. This should serve 6 well. I serve with a nice crusty whole grain bread. Everything is in the pot, veggies, and protein. Enjoy! it’s delicious. Don’t be put off, it’s really easy to prepare, can be made ahead of time. If it’s made a few days ahead you may want to add the chicken broth to thin out. 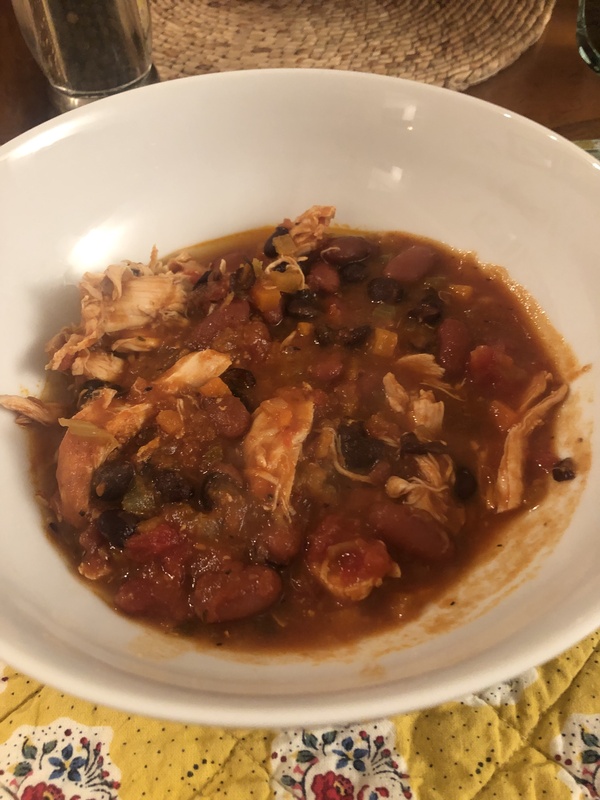 This entry was posted in chicken, soup, vegetables and tagged Chicken Stew, Chicken Stew in One Pot, Comfort Food, Healthy Eating. Bookmark the permalink.